Christmas is almost here and Mom’s been busy! She’s been hiding out downstairs in her new sewing room working on Poppy’s very 1st stocking. I stayed upstairs. Bored. Really bored. But, then she said: “Let’s wrap packages!” Wow, that was right up my alley, especially when there’s paper involved. And Mom doing stuff where I can “help”. See? First you hold down the paper so Mom can put some tape on. Then, you help fold the paper. Sorry, Mom….I didn’t mean to get some tooth marks on it. I think this package wrapping is pretty cool! I sure hope there’s something here for me. Toby and I thought the finished products turned out pretty good–do you think Santa will hire us? Mom said I was such a good package wrapper that she was going to give me a stuffie to play with. 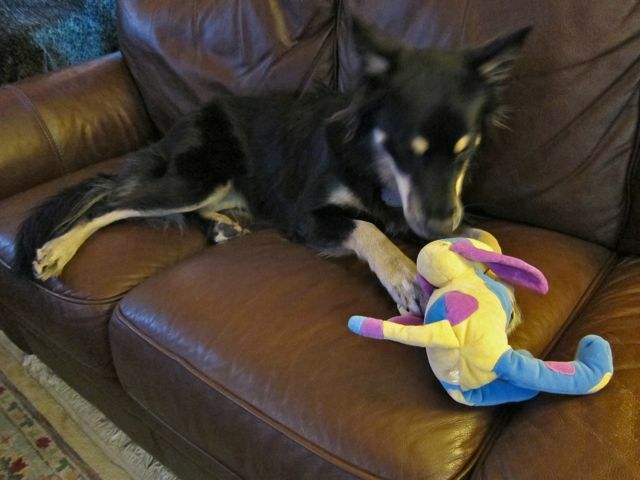 She’s never let me play with one before–do you think maybe I’m growing up a little bit? She said: “We’ll see….“ Not sure what she meant by that, but I know there’s something Toby and I want to tell you. To all my blog furiends out there a VERY MERRY CHRISTMAS! 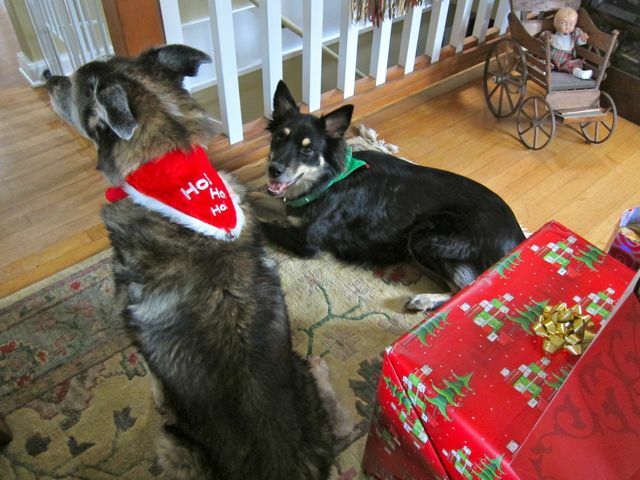 This entry was posted in Dogs and tagged Christmas, Sage, stuffie by Sage. Bookmark the permalink. This is so cool…helping out like that…..Have a great Xmas everyone…Peace and Joy! 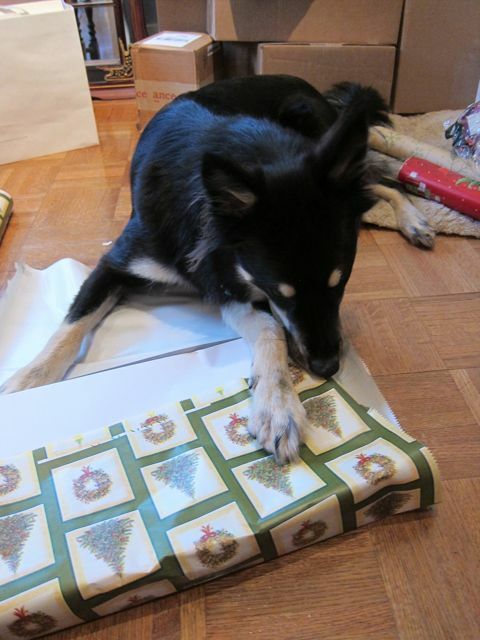 We bet Santa Paws was watching how helpful you were being – lots of pressies coming your way. 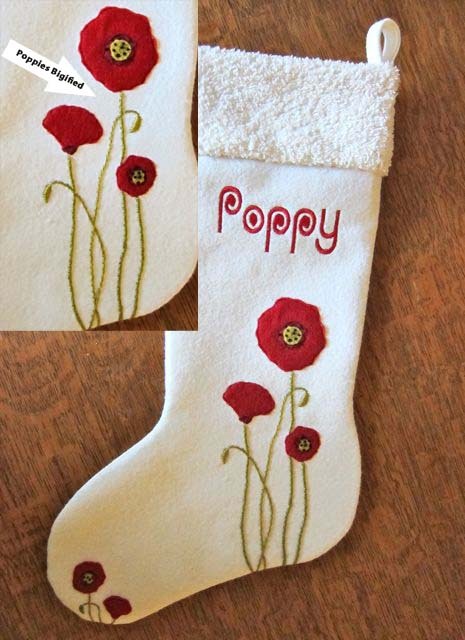 What a beautiful stocking for sweet little Poppy – her first Christmas. Sage you are an awesome package wrapper, great job!! You are a good wrapper, I’m good with bows, we should start a bizness…heehee! What a LUVLY stocking your mom made, Miss Sage! And you did such a nice job on the pressies! We didn’t get to help with any pressies but I think we will each get one! We think you’re a great package wrapper…..the momma here says maybe we should give you a call. Merry Christmas to you, too, Sage. And between you, me, and the bedpost, my Mom could use some of your expert help wrapping presents! your mum made the poppy sock? wow! she’s pretty smart. You are a great helper fur sure! One of the best gifts I ever received is your friendship! Merry Christmas O-Muddy-One! You’re so helpful, Sage, Merry Christmas! Your so good at wrapping presents Sage. Maybe yuou can come and help Fred and Gloria. Merry Christmas! Sage, you are definitely a better gift wrapper than the Hubster. I’m hiring you next Christmas! Happy Holidays!! Awesome Stocking, Great helping, Wishing a Merry Christmas!! Brando, Bogart, and Ziggy Too! What a wonderful gift wrapper you are Sage! Enjoy that stuffie! Thanks for letting us follow in your adventures. Hope you and your family have a very Merry Christmas! The Collies are very impressed and are practicing! 🙂 Great blog! Keep up he great job! Sage, I found you via Collies of the Meadow and I’m so glad I did. I’ve enjoyed the posts I’ve read so far and I’m looking forward to catching up on more! I have two lovely dogs – Bella and Bear … and a beautiful baby girl called Poppy Grace. I hope you’re having a lovely Christmas! Sage, we didn’t want to forget our special furriend in our Christmas wishes! Hope you and Toby have a grand Christmas with treats and holiday hugs. You are world class wrapper! I was so impressed. Santa would be a fool not to hire you! What a great helper! Fun Post! Hi Sage! Poppy’s stocking is so cute! Did mama make your bandannas too? Hope you got a cool gift! Wow, you are a fantastic wrapper! And what fun you had! I furry Merry Christmas to you guys! Love love love Poppy’s stocking! Mom is very talented! 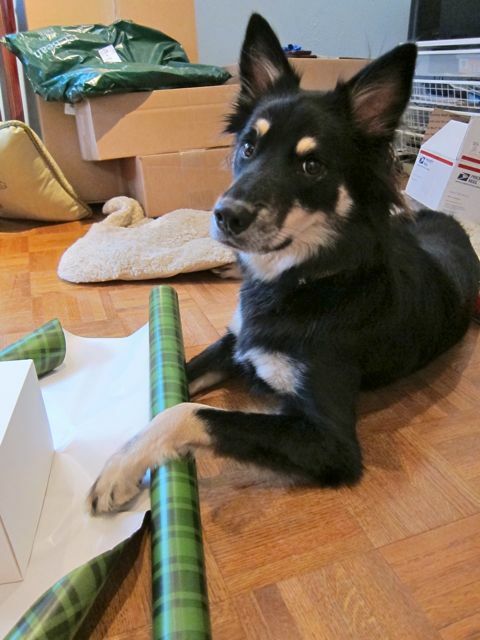 And I think you and Toby did a fantastic job helping with the wrapping. Hope you all had a super Christmas! Now, that is one beautiful stocking! wow! And, you are a big help. Everyone needs someone to help hold down the paper until the tape gets there. Merry Christmas. You are such a good helper! 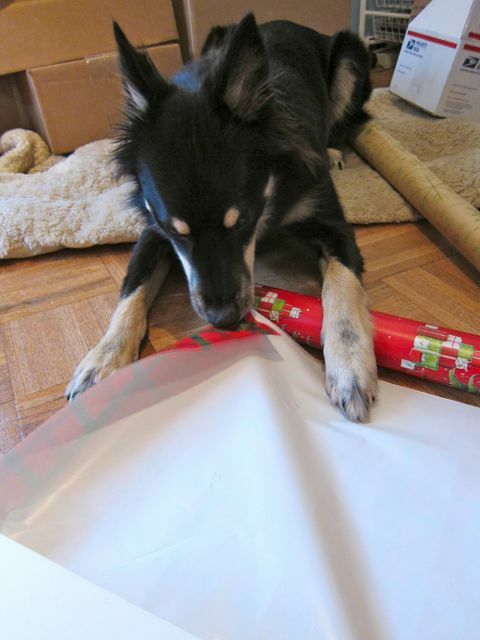 I like eating wrapping paper too! i’m super late on reading this post, but i’m glad i got to it. that stocking is so cute!!! btw, i’m not sure if you are interested in becoming a Triberr member to grow your blog traffic, but i’d love to have you as a tribe mate. let me know!